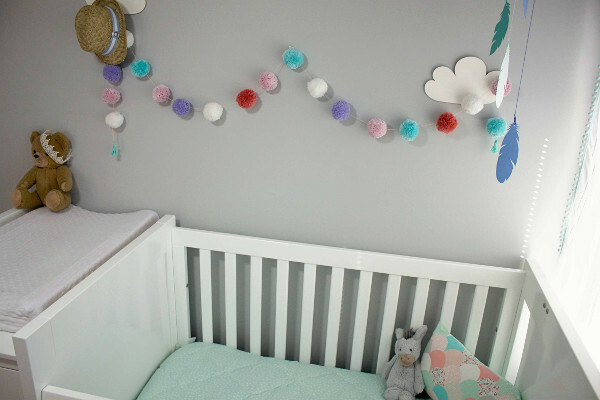 I don’t know if baby Mila is a good sleeper – but I know if I had a bedroom as lovely as this one, I’d be pretty chilled out most of the time. 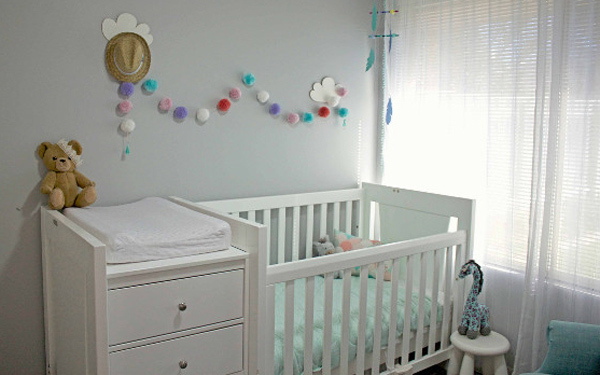 Come and see her beautiful nursery. This is a simply beautiful nursery, where everything just works. It’s all the more impressive when you discover that the bones of it were created to be gender neutral, with extra touches added after Mila was born. 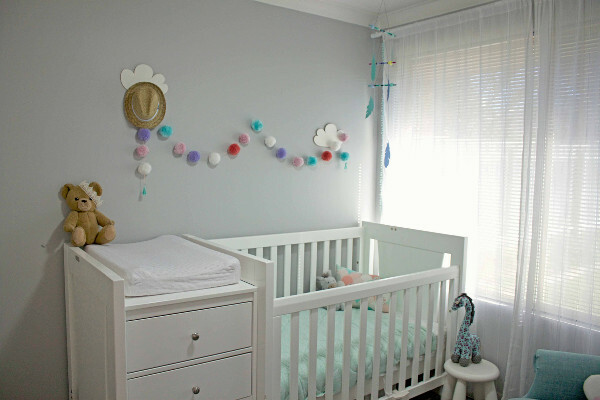 We didn’t know whether we were having a boy or a girl when I was pregnant so designing a gender neutral room was a massive challenge for me. We went with Dulux’s Tranquil Retreat on the walls and chose white furniture for the room. Mint green was the main colour and I had my chair upholstered in the Freedom Neptune fabric and added a mint green pom pom trim to sheer white curtains. We bought simple shelves from Ikea and I painted them white. Upon choosing the artworks I decided to go with a bit of a tribal/bohemian theme. 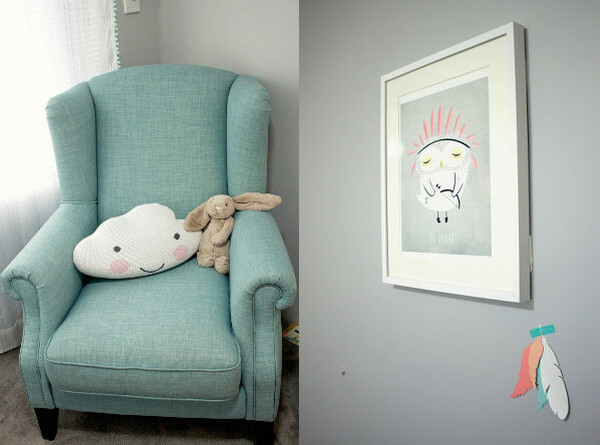 However, now I’d say there isn’t really a theme – just a colour scheme of grey, mint and peach/coral. 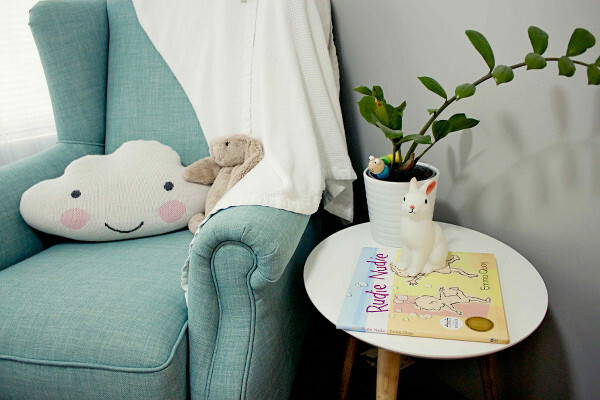 If we had had a boy, I would have incorporated grey, mint, emerald green and blue. When Mila arrived I got busy adding a few more feminine touches and made a lot of those things myself. I love her room – the space is really calming and peaceful and I believe a bedroom should be just that. 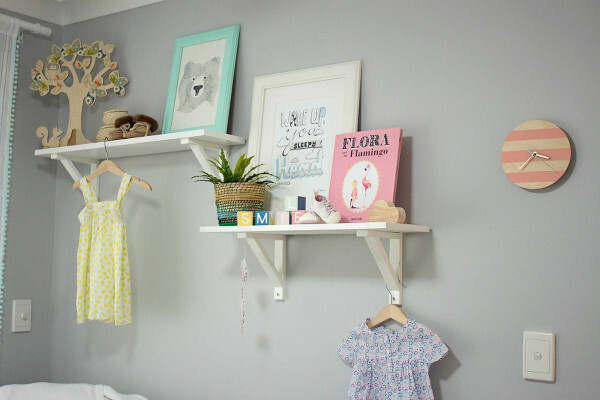 I have recently launched my own children’s design business Milamie and am now designing kids’ rooms with my mum, who is an interior designer. 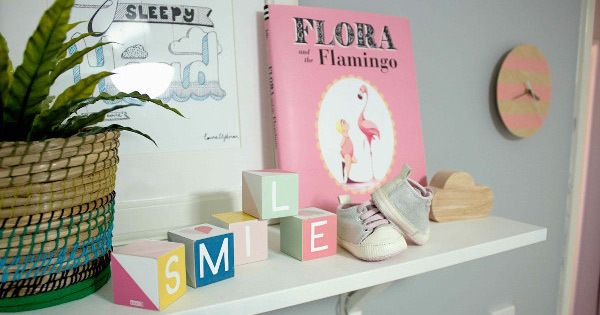 We are hoping to sell children’s accessories and homewares in the near future. One of the things I love most about this nursery is that there’s nothing here that’s difficult to source, but when it’s put together, it simply sings. Lauren certainly has an eye for colour and balance – mint green and grey is completely on trend right now and manages to be both fresh and relaxing. 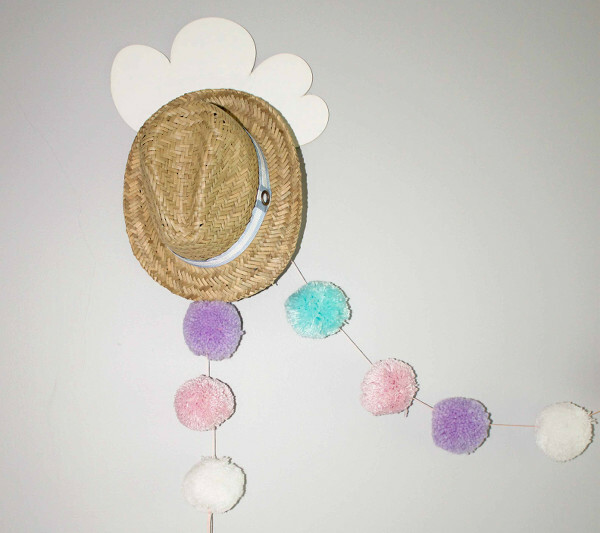 Lauren’s handmade touches (like her pom pom garland) show how much impact you can make in a room with even small pieces on a large canvas. Now, the most important part – where did it all come from? Never fear, we have a comprehensive list!